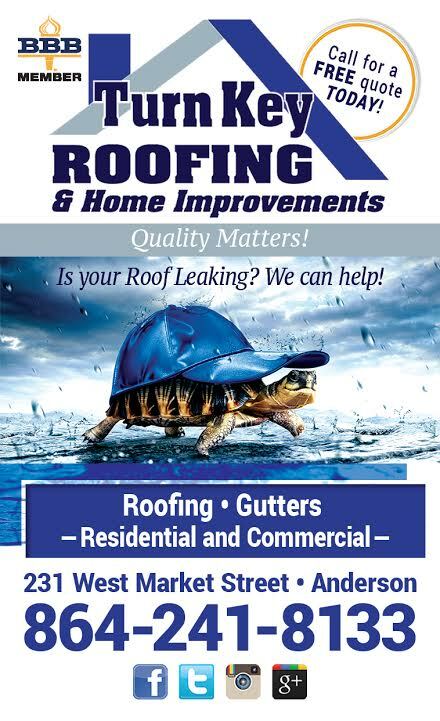 Residential and Commercial roofing and repairs in the Upstate of South Carolina. Providing 5″ and 6″ seamless gutter installation. Full line of gutter screens and gutter guards. As certified roofing applicators, Turn Key Roofing is a full-service contracting company that is capable of installing and repairing a variety of roofs, including commercial, industrial, residential, and motor homes. We also offer a variety of home improvement options, including gutter cleaning and remodeling. 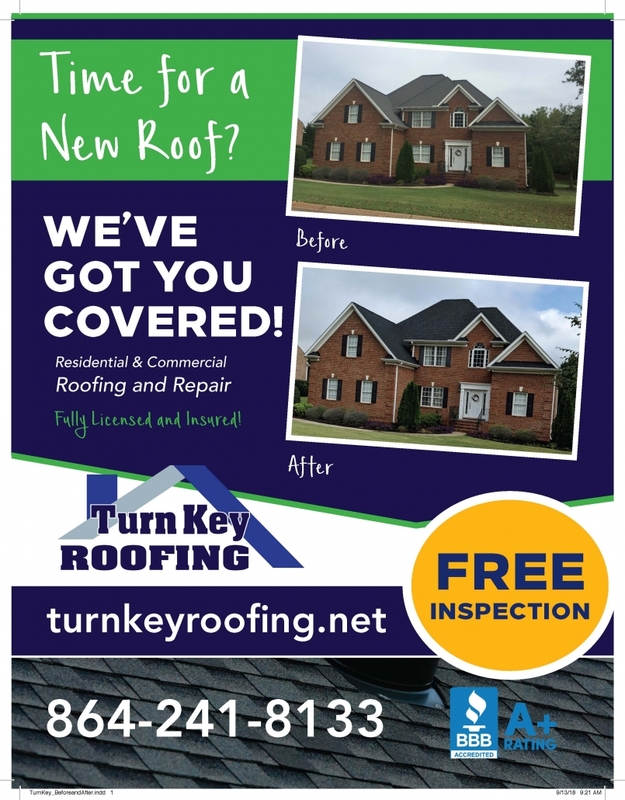 Turn Key Roofing provides roofers and contractors in Anderson, Simpsonville, Greenville, and other locations around the Upstate of SC. As one of the best roofing companies in the Upstate of SC, Turn Key Roofing is fully insured with bonding capabilities and an unlimited contractor’s license. We are dedicated to our clients and are committed to providing the maximum return on their investment. In fact, our customers believe quality workmanship, timely installation, coordination, superb communication, determination, and heart set us apart from our competition. 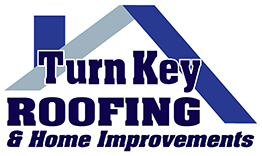 Turn Key Roofing is a GAF Master Elite Contractor, An Owens Corning Preferred Contractor, and a CertainTeed Master Shingle Applicator. This all adds up to a superb team dedicated to quality roofing work with superb customer service. To maintain this reputation, Turn Key Roofing is committed to providing the highest quality products and services to exceed the expectations of our customers, employees, and suppliers. With over 30 years of service to homeowners and commercial businesses in the Greenville, Anderson, Simpsonville, Greer, and surrounding upstate area. Turn Key Roofing is the preferred choice for quality roofing installation, repairs, home improvement, and maintenance. Finally, our professionally trained roofing contractors use only the highest quality products during construction and a defined final inspection process to eliminate the headaches. This leaves our clients with peace of mind knowing that their system was properly installed. We are factory authorized by most leading manufacturers, and specially trained to correctly install a system that is right for any customer. Minimum of two years operating under the same business name. In good standing with the Better Business Bureau. Holds at least $1,000,000 in general liability insurance. Carries all required state and local licensing and insurance Knowledge of the latest industry standards and technology. Dedication to customer service and professional craftsmanship. The Master Shingle Applicator program provides education in every aspect of shingle installation techniques, and the approved procedures for installing all CertainTeed shingles. The program utilizes the Shingle Applicator’s Manual and covers topics such as good workmanship practices, roof systems, estimating, flashing, ventilation, and product installation instructions for all of CertainTeed’s shingle products. Turn Key offer 5″ and 6″ Full Gutter Systems. Our Leaf Sentry System is worry free, maintenance-free and is a cost-effective gutter system. We are Manufacturer certified. If you are looking to maximize your existing roof we can install a commercial elastomeric coating. We offer up to a 10 years no leak warranty on a full coating job.